Your one stop shop for all your official Bike & Build apparel and gear. Please remember that Bike & Build's primary focus is running our core programming and that the gear store is a way for us to liquidate old gear as well as provide friends, family members and past/future riders a chance to pick up some discounted cycling apparel. As such we operate somewhat differently than many online stores. There are NO rush orders. Orders will ship approximately once a week. We only ship via USPS. No exceptions. Exchanges can be made for a similar product or credit towards another, and only if the item is unused in original packaging with all tags still attached. Exchanges are given minus shipping cost. So if you paid $5 for the original shipping cost and you want to exchange the item you'd need to mail it back to us in addition to paying shipping costs for the new item. 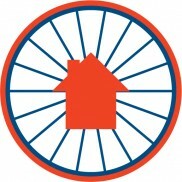 We're not actually a clothing store, we're a non-profit that runs cycling trips to benefit affordable housing. Orders may ship slower than if you bought a jersey on Amazon, and these sales only represent a fraction of a percent of our total revenue. You're supporting an awesome cause, not a corporate clothing giant! Please be flexible when ordering. We do our very best to keep inventory and products up to date, but if something changes in your order we will let you know ASAP. If we are unable to provide the product you purchased you will receive money back (including shipping) for that item.